The problem with current weather apps is that they feel too scientific, too black and white, no room for variation or creativity. On the opposite end, social apps are too open, content is created about anything. I was challenged to develop an app concept that would enable the users with a form a storytelling. The element of weather is something that we can all relate with, changing over time and space, making for interesting stories. 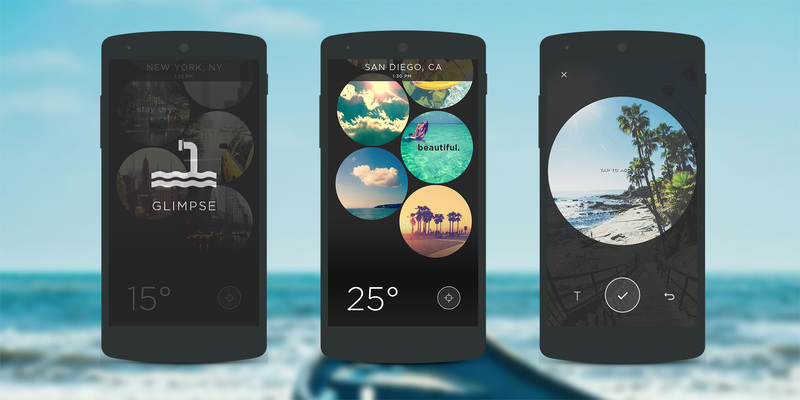 Glimpse is a weather app that allows users to check the weather through visual storytelling, rather than clinical numbers. Users can use the app to get to the minute weather updates in a particular area, and share their own weather updates with others. See new content in real-time. Playing off of the idea of taking a peek into the lives of other people, UI animations played an important role in showing the main function of the app, which is seeing content uploaded in real time. The popping bubbles play with the visual language of the app, as well as serve their function for displaying new content. Take a glimpse around the world. With simple, easy to use navigation, users can take a glimpse at the current weather but in different places around the world. Play with Glimpse for yourself with this prototype made with Marvel. As an individual student project, I worked through establishing the problem, brainstorming through solutions, developing AI, wireframes and visual comps, and roughly prototyping the interactions and animations. I used Adobe Photoshop for the visuals, Marvel for the clickable prototype and Quartz Composter – Origami for the UI animations seen in the marketing video.